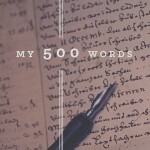 Day 10 of the My 500 Words Challenge! Write about writing. What do you love about the craft? What do you hate? What are you struggling with, when it comes to this challenge? If you read my post from Day 5, Cow Pasture Chronicles, My Oasis, you already know when I began putting pen to paper. As a young it was more about finding my voice in a crowed and loud home. When you’re surrounded by so many others, a listening and understanding ear is hard to find. Writing became an escape and gave me the satisfaction that someone was listening, even if they were the four-legged kind. When I began college, an English Professor, Nancy Moore thought my writing was exceptional and encouraged me to major in English. Of course with her high praise, she became a favorite of mine. I’m amazed I remember her name. An English major lasted a year before I changed it to Nursing, but my love of writing and words continued to grow. My mother planted that seed a long time ago with her love of books; reading was a family affair. Which brings me to why I love the craft. It’s the stories, plain and simple. To me there is nothing so intriguing and exciting as a story which transports you to the page. Or, as I did the other day at the gym, exclaim out loud, “OMG.” In case you’re curious, I’m reading Stephen King’s, A Good Marriage. It’s the stories of our lives, the people, places, things, and events we experience along the way that give us our stories. Writing, like no other craft, sets the imagination free with no boundaries. Okay, maybe a few. Which brings me to what I hate about the craft. Rules and competition top my list. The rules of grammar are stifling sometimes. I know, many of you will throw your hands to your chest in shock, “You must follow the rules. By the way, watch out for weak words and passive sentences. Show, don’t tell. Make your opening sentence, paragraph dynamite. Check pacing and sentence length, and without conflict and rising stakes, and without the proper structure, it won’t work. Now, before y’all (southern slang) started scolding me in print, let me say, “I understand the need for rules, some of them, but when your focus becomes micromanaging every sentence, you lose the ability to let the story flow. Instead, it can feel like labor, a long, arduous labor. I’ve always believed competition a good thing; regardless of the enterprise or the craft. But, with a zillion people on the internet and probably as many blogs, being heard becomes a game of chance as much as skill. A chance that a blog post will go viral, the right person with the right connections likes what she read and passes you on to others. Contests are a whole other type of competition. With thousands of entries, getting your story to stand out, becomes like a needle in a haystack. Yeah, yeah, I hear you – “If the story is good enough, it’ll stand out. Maybe, hopefully, or perhaps, the screening reader doesn’t like your genre, or plot line. Not that it wasn’t well written, but that kind of story ain’t her cup of tea.” Submitting work is challenging, time-consuming, and the rewards, few and far between. What am I struggling with, related to this challenge? Time, plain and simple. I’m somewhat of a perfectionist and I didn’t like missing Day 8, but the one thing I’ve learned since I began writing (and it’s difficult), is to recognize when I need a break, to stop pushing, and take time to relax, and let my mind wander the fields of words and imagination. Thanks Jeff, for the challenge and todays prompt. Tell me what you think. Tell me your story. I’d love to hear from you. And as always, you can follow me on Facebook at SheilaMGood and Twitter @cofcmom.